I have asked Dean a Gurgle nominated Daddy Blogger, otherwise known as Daddy Natal, to write for Not Even A Bag of sugar, as I am very concious that I write purely from the perspective of a mother. Dads have a vital role to play in the care of their premature baby, and its important that we support dads going through this scary and difficult time. I know my husband felt the weight of the world on his shoulders when Joseph was born, and he did a fantastic job looking after the two of us, but I realise that he didn't have a good support network and still feels traumatised about Joseph's premature birth. I hope you find what he has to say, and the perspective of the three dads he has interviewed helpful This is part 1 of a 2 part piece. I had been talking to Kylie and she asked me if I would write a piece on dads and premature babies. Having spent some time mulling this over, I decided that although I can write about it, from my training, working with dads and work on the MSLC at Peterborough hospital, I hadn’t experienced it. It was further bought home to me when one of my dad’s (yes they are mine!) having attended the first class with me, two days later had his partners waters break at 34weeks and 1 day. I spent the next few days supporting them, when they needed me to answer questions or offer reassurance, and at 34 weeks and 6 days their daughter was born, 5 weeks premature. No.....we had talked about it, but even up to 28wks, we had not attended any. I attended half of a DaddyNatal course but that was all. Vicki hadn't attended any classes. We were not prepared at all! We were warned around week 24/5 that Freddie was small, not growing....and that he may have to be born early. We assumed around 33/34 weeks, but even then, we did not research or start to prepare ourselves for a premature birth. When he arrived 2-3wks later, we were shocked, traumatised and totally ill-prepared. I was prepared mentally to have a child, I work with children and love cuddling all my friend's babies. Regarding research, I had read 'The Pregnancy Book' provided by the NHS and I also had various applications on my phone with information regarding pregnancy and baby development. Oh, there are many.....you can refer to the blog. Day 3, Day 16, Day 35. I've had to think hard about this. I can't really say the surprise birth was the worst part, however scary it was, it was just a blur and was over in 10 minutes. 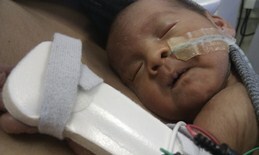 When Felix had a bleed from his lungs on Day 2 of his life, my wife and mother were with him. I received a phone call to come straight away and was warned it wasn't good. 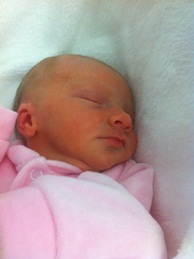 When I arrived, both my wife and mum were waiting outside the ward. 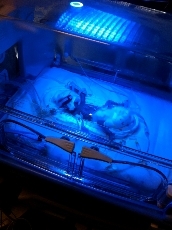 As I peered through the window, I could see the white screen being set up around his incubator whilst doctors and nurses from different wards appeared to stabilise him. All we could do was wait. Huh! That he was going to make it - I wouldn't have spent 82 days worrying so much! But seriously, I wish I was more aware of premature births...even if we were/were not going to have an early delivery. You are never fully prepared for what you are about to see. Did we do anything to cause the premature birth of our child? We still don't know why Felix came so early. Ask friends for help......travel, costs etc etc. I hope you have enjoyed this post from Dean. Please have a look at his blog and website, there is a wealth of information there from a dad's perspective. And stay tuned for part 2! If you have enjoyed what Dean has written please vote for him for Best Daddy Blogs in the Gurgles a prestigious award created by Mothercare. Also please vote for the sister blog Bump Birth and Beyond in Best Overal Mummy Blog. Great post by Dean, as ever. Plus I've been introduced to a new blog! Love it. 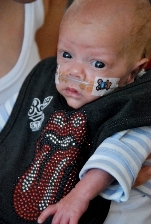 Thanks for sharing Freddie's story. Ross.